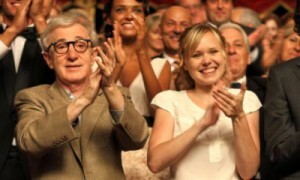 Woody Allen and Alison Pill have reason to cheer in From Rome With Love. The comedy romance To Rome With Love is the 42nd feature film written and directed by Woody Allen (You Will Meet a Tall Dark Stranger) since 1966, which is damned near close to one a year. Whoa. To Rome With Love offers a quartet of independent vignettes about four characters whose adventures change their lives forever: an average Roman (Roberto Benigni) wakes up one day to find himself a well-known celebrity; an American architect (Alec Baldwin) revisits the streets on which he used to live as a student; a young couple on their honeymoon are pulled into separate romantic encounters; and an American opera director (Woody Allen) tries to turn a singing mortician (Fabio Armiliato) into a star. The expansive cast of the film includes Allen, Alec Baldwin (Rock of Ages), Roberto Benigni (Life is Beautiful), Penelope Cruz (Broken Embraces), Judy Davis (Naked Lunch), Jesse Eisenberg (The Social Network), Greta Gerwig (Damsels in Distress), Ellen Page (Inception) and Alison Pill (Goon). Though not nearly as good as his previous film, 2011’s Midnight in Paris, which was Woody’s highest grossing film of all time ($57 at the domestic box office) and for which he won his fourth Academy Award (this one for Best Screenplay), To Rome With Love is still fun, flirty and beautiful to look at. It rang up a not-horrible $16 million at the U.S. box office.